After a long period of hesitation, I finally ordered myself a pair of pants with custom measurements just before Christmas. The only thing that held me back from what is such a sensible idea is the fact that I like to see things I buy (even if that means looking in a shop and then buying online). But after yet another frustrating and unsuccessful shopping trip looking for any 'tall' clothes, I thought I'd give it a try. I am glad to say that the trial worked perfectly. I am now the proud owner of a comfortable and well-fitting pair of chinos and a firm convert to custom-made clothing. I have since extended my trial to shirts and (with some help and advice from the helpful staff) this will definitely be my usual way of buying shirts in the future - I'll write a post as soon as I have time. Please do comment if you have your own stories about custom ordered tall clothing. The site I used was Tailor Store, which offers two styles of chinos in different colors and two fabric types (Derby is quite a heavy, thick fabric and the lighter Nottingham) as well as shorts, shirts, polo shirts and even custom-made underwear. You can specify all of your measurements and various other options such as pockets and stitching. This means you are no longer limited to a '36 waist' or '36 inseam' - if you need a 35.5 inch waist and a 36.6 inch inseam that's exactly what you get! I also chose a slightly higher waist since I hate my shirt coming untucked from 'low rise' pants. I liked this site partly because they are also very open about where the clothes are made (Sri Lanka) but also the use of organic textiles and information about working conditions and where the fabrics come from. Despite coming from the other side of the world, my order reached me within 2 weeks and was cheaper than I would pay for a pair of (too short) pants in my own home town. 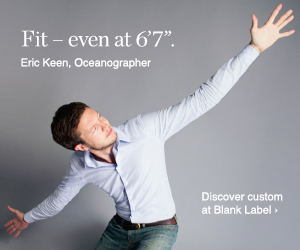 The range of options for custom made clothing is increasing which is great news for tall men. Make Your Own Jeans also offer both jeans and chinos (made in India) and Indi Denim offer jeans (although if you want brands or are happy with 'standard' measurements, there are quite a lot of options for jeans in 36 inseam and 38 inch inseam - see other posts on this blog). Suits have always been available custom-made but newer internet based options like Indochino or Proper Suit are making what was once a luxury into an affordable item. Custom made shirts are also readily available now - check out our directly for some options but also watch this space for posts in 2012! I am now very keen to see whether a custom tall shirt will be as good as my new chinos! Still, you can't get everything online custom-made, so Clothing Tall Men will continue to scour the shops and the internet for the best options for tall men's clothing - please stay with us and share your own finds. Thanks for this comment from Smartguy. I am happy to see that for men in Europe, www.smartfashio.com offers some 36 inch and 38 inch inseam trousers. Always good to hear of new suppliers! Very interesting. Thank you very much from Canada! Thanks for the tip, will try these out for shirts as well! My only grief is that they dont show any real models with the clothes on.